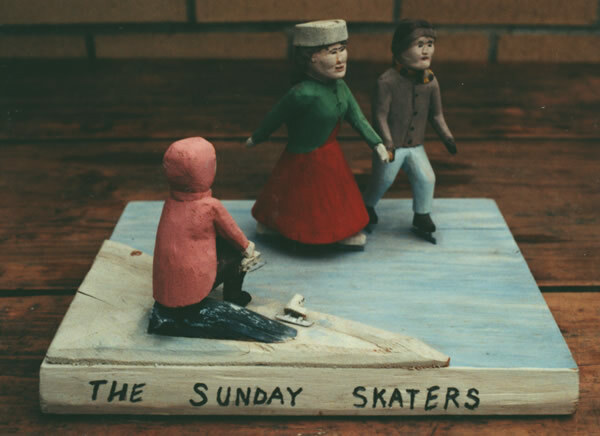 You won’t find many references to Joe Lloyd in the folk art books. It is difficult to see his work in museums. To my knowledge he never received an award or was offered a show in a public gallery. But besides being a heck of a nice fellow, Joe was a dedicated folk artist, and he had his niche. I met Joe in 1994 when I picked up signs he had voluntarily made for the one time Canadian Contemporary Folk Art Festival which was held in Paris, Ontario. He lived near the hospital in Brantford, and he and his wife Janet welcomed us in for a cup of tea in spite of the fact they did not know us. In the living room, behind him on some built in shelves there were many examples of his work. All on a smaller scale with the biggest being about ten inches tall. I asked him how he got started, and what he was carving at the moment. He told me his carving life began at age 14, and he won a prize in grade five for his ivory soap carving of the Lone Ranger. 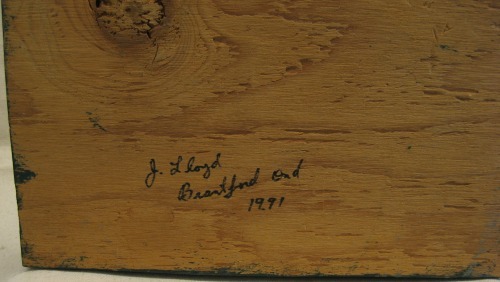 Joe continued to carve occasionally but really “got back into it” in 1976 when he moved to Brantford, and met and was encouraged by local folk artist Gordon Papple. 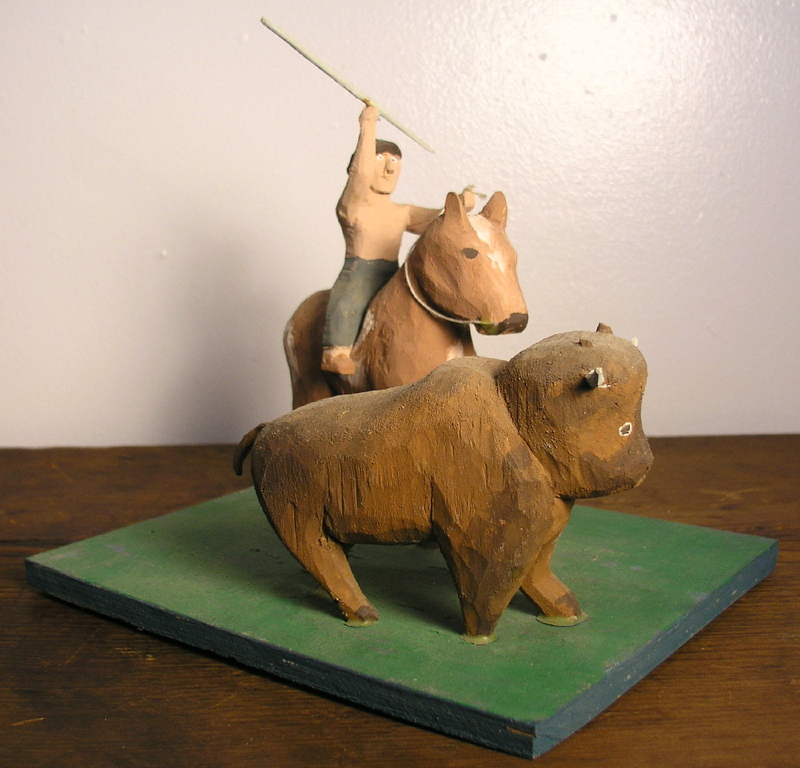 Joe’s subject matter evolved from wildlife carving of fish, bear, and birds, into carving the human figure, and then he began to place those figures in small scenes, many which are interictally detailed. 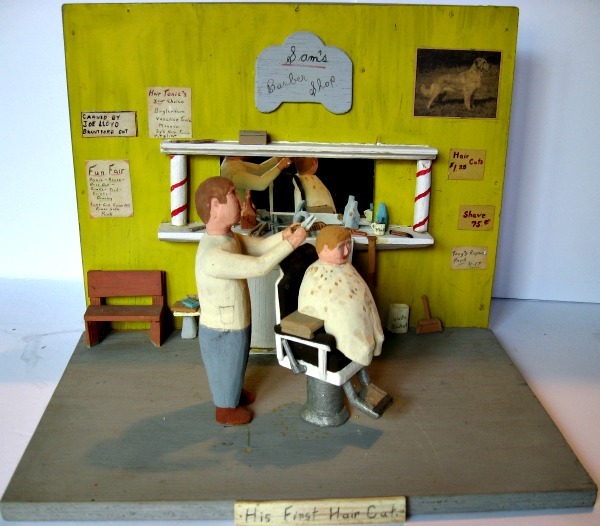 Typical subjects of Joe’s sculptures are sports figures, cowboys, super heroes, soldiers, and domestic scenes such as a man changing a tire as his wife looks on, a farm auction, a butcher shop, and a kitchen scene, a barber shop etc. All of his work is carved and painted and most of it is signed. His prices were very reasonable, typically asking between $25 to about $60 for his most intricate pieces. Joe was a modest man. He told me he didn’t care about being paid for all the hours he put into producing the pieces, and was just happy to have the pieces go to appreciative homes, so the place didn’t clutter up, and he could feel free to produce some more. We bought eight or ten pieces that day, and would call Joe every six months or so to see what he had been up to. Usually going home with six to ten pieces. Then in 2005 when I curated the Finding Folk Art exhibit at the Eva Brook-Donly Museum in Simcoe, we included Joe, and asked him to participate in a one day folk art sale which was a part of the proceedings. It was great fun, and he did very well that day. Years slipped by, and we got busy with new ventures and life direction and we just didn’t get around to visiting Joe much after that. A couple of years slipped by and the next thing we knew we were reading his obituary in the paper. We didn’t know joe very well, but we really liked him, and we are glad to have known him and to own some of his pieces. At his best, his little, detailed miniatures look into moments of human behavior with a simplicity and clarity that make you happy to be looking at them. They are both light-hearted, and observant. Because his work was not large or flashy it is easy to underestimate him. He stayed in his area, and he was good at realizing what he was imagining. All this and not a self-conscious bone in his body. When he participated in the Simcoe exhibit we had him provide us with some biological details. This is what he told us. 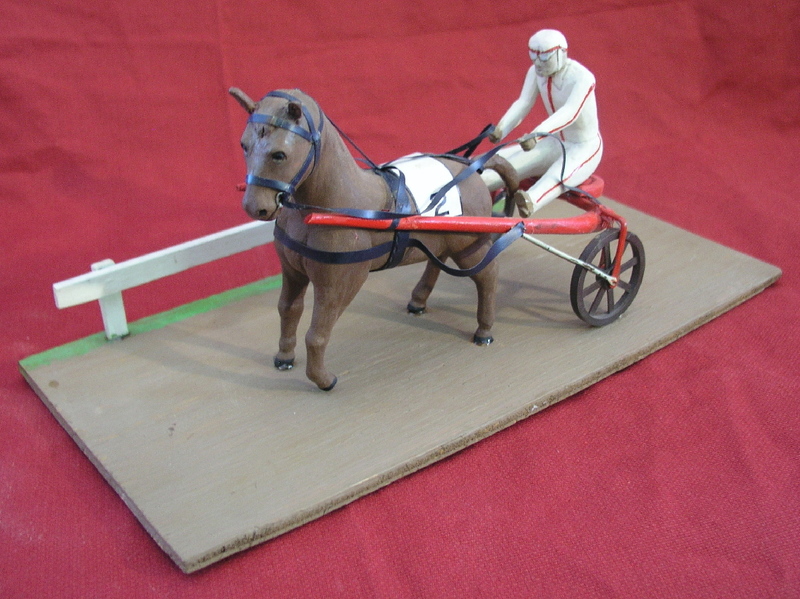 Joe Lloyd was born in 1937 in Ernstown, South Fredricksburg County, near Napanee Ontario. When Joe was one, his father became involved in cheese production.and moved the family to Aston, Ontario. Then when Joe was fourteen, he moved with his family to Carlton Place when his father got a job at the Finley Forge making cook stoves. Joe left school at the age of fifteen, and went to work at various jobs in woolen mills, sheet metal plants, logging, pulp and paper mills, and then with the C.N.R. and Great Northern railways. Then Joe crossed Canada twice working on construction jobs in bridge work, highways, building construction and renovation. As a laborer, then carpenter, and foreman he has helped to build houses, bowling alleys, airplane hangars, cottages, and the Maple Leaf Gardens. Joe worked from 1976 until his retirement in 1999 as a maintenance worker, and then night security at the W. Ross MacDonald School for the Blind in Brantford, Ontario. 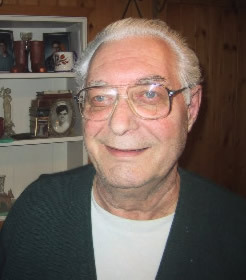 Joe lived with his wife Janet in Brantford until his sudden death on April 21, 2011 at the age of 74. He is survived by Janet and two grown sons. I’m looking at a little crane that he carved and gave to Jeanine when he noticed she had a collection of carved birds. It makes me smile. His work lives on. So long Joe. It was good to know you.